Cities can sometimes get too large to have coherent music scenes, and thus they splinter, into Shinjuku, Lower East Side, West London, and so on. just as they can be too large to enable a novel format. So the city-wide scale of Our Mutual Friend becomes the focused suburban view of London Fields. I find myself wondering whether cities have to be relatively large to enable an architectural scene. The physical infrastructure, higher unit costs and lack of pace endemic to building urban fabric require a little more scale than lighter, more fluid creative industries. A medium- to large-sized city is required, perhaps, to go beyond the influence of a single architect or practice. The big three eastern Australian cities are certainly big enough to have claims over architectural scenes, though it’d take a braver person than I to offer a detailed demarcation of each. So what follows is a brief theory constructed to provoke and confuse, based on a reading of the city's scenes in which any contrary examples are ignored in order to make my point. The Melbourne scene is clearly expressive, discursive, chock full of ideas, playful, bold, aware that the rich loam that is the city’s uniquely rich discourse in architecture and design offers up opportunities for experimentation. And thus firms like ARM, DCM, Wood Marsh, Paul Morgan Architects, John Wardle Architects, BKK, Crowd, Andrew Maynard etc. (It’s where FAT would be based, were they Aussie.) Derived from the intellectual platform of Gromboyd rather than their formal approach. Sydney famously specialises in a regional modernism or organic modernism, derived from the Sydney School (aka ‘nuts and berries’ school. 50/60/70 has more on that.) Thus JPW, Hill Thalis, Stutchbury & Pape, Alex Popov. 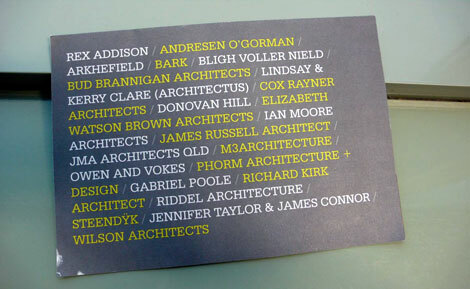 Cox and Seidler to some extent. The sails of the Opera House and lightness of touch of Glenn Murcutt above all. But Brisbane has been the story of the last few years in Australian architecture, as noted here before. The freedom afforded by the sub-tropical climate and the rich vernacular of the ‘timber and tin’ tradition combine with a newly found economic and cultural confidence, to enable a scene which plucks what it likes from both the aforementioned traditions and fashions something new. This confidence is manifest in a forthcoming exhibition at the Gallery of Modern Art this August to November. It'll necessitate another trip - at least the fourth this year. Oh for a high-speed rail link - but I'm already excited about it. The exhibition is dubbed ‘Place Makers’, hinting both at the wider remit of good architects and their contribution to the new Queensland. Apparently, it’ll be the largest exhibition of contemporary architecture ever staged in an Australian art museum, so it’ll be fascinating to see how they present the work, as place-making doesn’t necessarily lend itself to models and drawings, as beguiling and useful as they might be. “‘Place Makers’ presents architectural projects that successfully address key aspects of subtropical living, as well as urban renewal and density, and the timeless concerns for basic human needs and wellbeing. 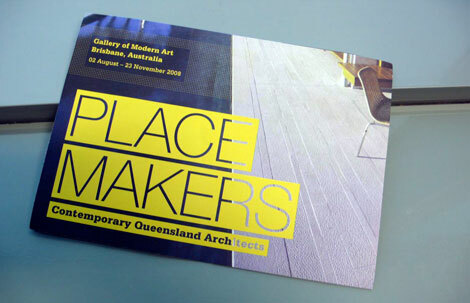 The exhibition reveals the extraordinary diversity of residential work being produced in Queensland, and includes internationally recognised commissions for individual houses, modest suburban ‘infill’ designs, an isolated dwelling in regional Queensland, innovative new public housing, and an exemplary coastal high-rise.